EFF and Craig Newmark's team at craigconnects have created an infographic about Section 230 of the controversial Communications Decency Act (CDA) of 1996. Though many provisions of the CDA were rightfully found to be unconstitutional, Section 230 remained, allowing the Internet to flourish while fostering free speech. 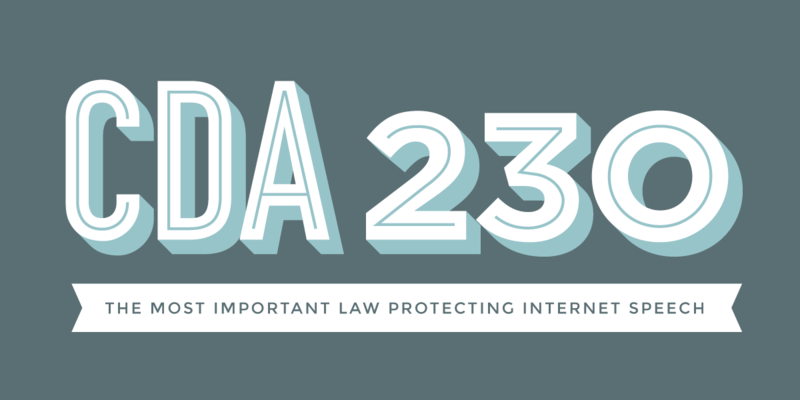 CDA 230 provides websites, blogs, and social networks that host speech with protection against a range of laws that might otherwise hold them legally responsible for what their users say and do. CDA 230 is a fundamental shield that allows Yelp to host reviews, Craigslist to host classified ads, and Facebook and Twitter to host users' posts. Without it, websites and Internet Service Providers would be more expensive, operate with less efficiency, and be motivated to censor.